It’s the little things…things like buying a basic DESK. I live in a nice-sized apartment. The entire building was renovated, inside and out, as I moved in six years ago. It was originally built in 1953, and as such, it has some quirks. This corner was a headache from the moment I moved in. As you can see, the cable outlet is coming out halfway up a wall. And at the perpendicular wall is my fireplace. So because of where the cable comes out, this is where any TV or computer terminal I installed HAD to be. But because of the fireplace, any desk I put near the cable outlet either had to be really tiny (to fit beside the fireplace), or would go along the wall under the outlet, and so stick way out into my living room. 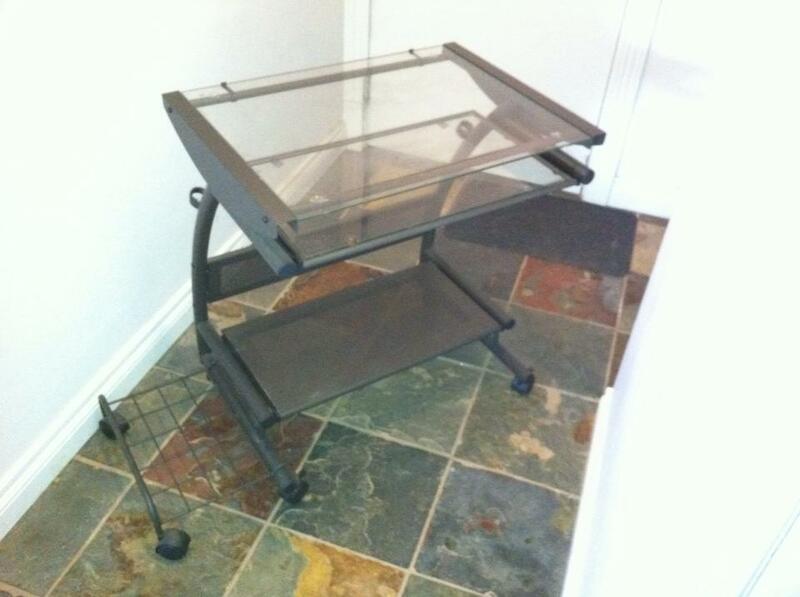 When I first moved in, I bought a computer cart, which I thought would be small and mobile enough to tuck into the corner and do the trick. 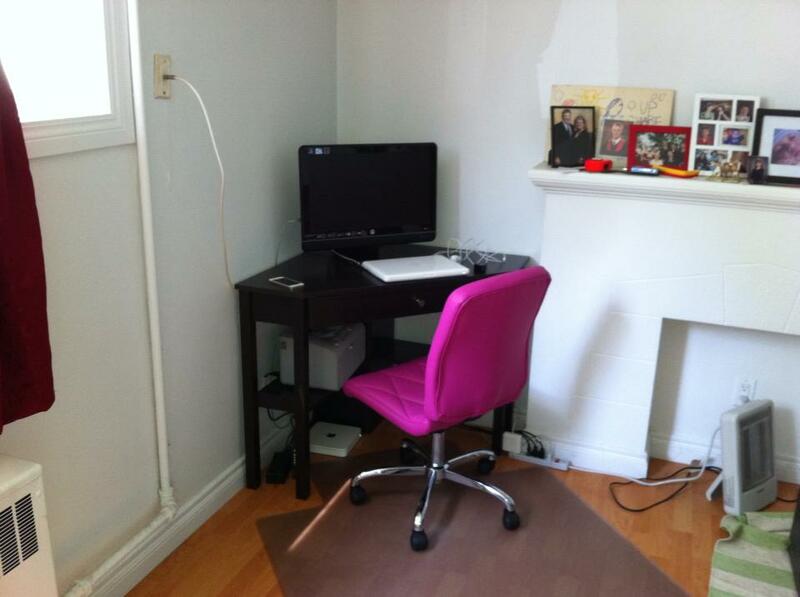 So I was very tickled when, after some concerted searching, I found my black corner desk. And now that I have a car, I could even get it myself. It was an assemble-it-yourself desk, in a long box. I fetched it, with some manouevering onto the cart at the store, and it fit into my hatchback. And then I realized the problem: I didn’t have a shopping cart at home. Nor did I have anyone to help me get it in. What I had were stairs, and two narrow doors to get the long, 150lb box through. On the way home, I phoned my cousin – a strapping, 23-year-old boy. He wasn’t home. I was meeting some friends for dinner, and put out the plea to the males around the table. No go – it was Thursday, and like me, everyone had to work the next day. On the drive home, with the long, heavy box in the back of my car, I came up with an idea. Once home, I opened the hatch, opened one end of the box, and brought the desk into my apartment piece by piece. 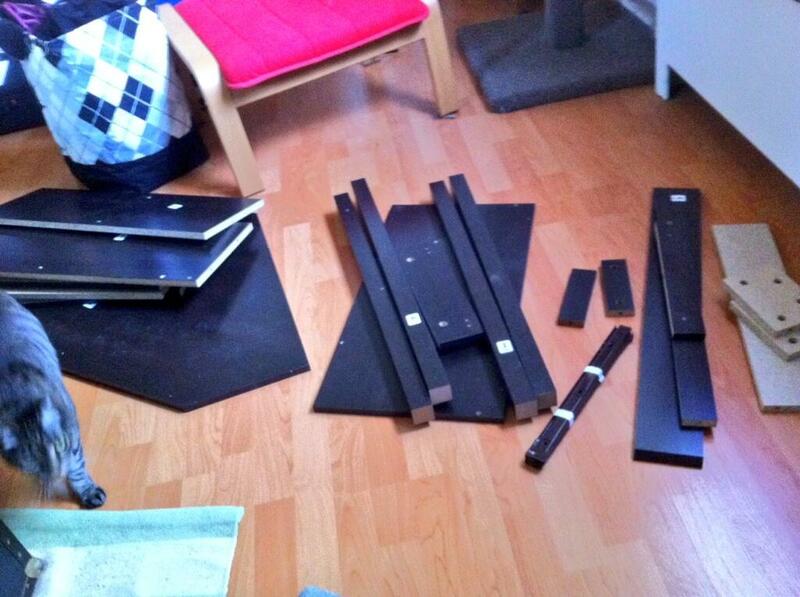 This entry was posted in musing, writing and tagged cousin, Furniture, ikea, some assembly required by theatrejunkiehm2012. Bookmark the permalink.